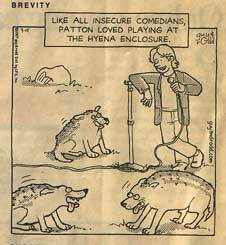 This cartoon cracked me up — and makes a legitimate point about comedians. • Appropriate Topis for Any Given Audience. But most of all, you have to have confidence. Audiences know right away when we are psyched-out and insecure. It makes them feel uncomfortable, and really brings down our performance and ratings. The hard part is that this confidence is nearly impossible to teach. In my opinion, it just comes after years of experience and thousands — yes, thousands — of performances. New to comedy? Just keep it up! * Unless your audience is comprised of hyenas. In which case I’ll pass. https://www.bradmontgomery.com/wp-content/uploads/2018/11/logo-1-495x198-1-300x120.png 0 0 admin https://www.bradmontgomery.com/wp-content/uploads/2018/11/logo-1-495x198-1-300x120.png admin2008-12-31 18:24:302008-12-31 18:24:30Insecure Comedians? Illinois Probation! I Miss You! USDA in South Dakota? You Bet! Brad’s New Rule: I will never speak in this venue again. Aurora Mental Health: Howdy!